Freshman star Melo Trimble has developed quickly for Maryland, pushing the Terrapins into the tournament in a season many thought would be lost. COLLEGE PARK, Md.—There’s a simple, two-word phrase that Maryland coach Mark Turgeon uses sometimes around Melo Trimble. At its core, “Be Melo” is a reminder for Trimble to believe in himself. Trimble has done this more often than not over the last few months, and it’s one of the main reasons Maryland is on track to deliver its best season in the last half-decade. He was being Melo when he scored 26 points to help the Terrapins edge Nebraska by three points last Thursday; when he overcame getting poked in the eye and having a TV camera fall onto his face out of bounds to deliver 20 points at Iowa on Feb. 8; and when he buried two free throws with under 30 seconds remaining to help complete a stirring comeback against Northwestern on Jan. 25. Entering Tuesday night’s showdown with No. 5 Wisconsin, No. 14 Maryland is 22-5 with a 10-4 record in the Big Ten and tied with Purdue and Michigan State for second place in the conference as it seeks its first NCAA tournament berth since 2010. Trimble, a 6'3" freshman from Upper Marlboro, Md., leads the Terrapins in scoring (16.1 points per game), assists (3.1), steals (1.4) and minutes played (33.4 minutes per game). It is no huge stretch to suggest that Trimble—who was not rated in the top 25 of the class of 2014 by any major recruiting service—has been among the most valuable, if not the best, freshmen in the country this season. Yet while his statistics are indication enough of his impact on Maryland’s program, one can’t fully understand his value to the Terrapins without looking back to before he even arrived in College Park. Last April, Maryland announced that rising senior guard Nick Faust, rising junior center Shaquille Cleare and rising sophomore guard Roddy Peters had been granted permission to transfer. In a more surprising development about a month later, rising junior guard Seth Allen, the first player to commit to the Terps under Turgeon, was granted his release. The wave of defections added to the sense that Turgeon, who had yet to take Maryland to the NCAA tournament in his first three seasons there and was a popular name on hot seat lists, was entering a critical campaign. In May, Terrapins athletic director Kevin Anderson gave Turgeon a vote of confidence, saying “I totally support Mark.” In Trimble, Turgeon was bringing in a player with the potential to help steady the program. Trimble's relatively smooth transition to college is hardly indicative of his recruitment. Trimble said he grew up rooting for Maryland, which he described as his dream school. He said he remembers watching the Terrapins win the national championship in 2002 behind guards Steve Blake and Juan Dixon. Dixon drew headlines when he joined Turgeon's staff as a special assistant in November 2013, but it was a concurrent development that was more relevant to Trimble's future. That same day, it was announced that Terps assistant Dalonte Hill was resigning. Hill had been Trimble's lead recruiter, and he came to College Park when Turgeon was hired in May 2011 to replace retiring Hall of Fame coach Gary Williams. Hill's hiring had been viewed as a momentous move. He had strong recruiting ties in the Washington D.C. area and had served as a coach for the AAU team D.C. Assault. At his previous college coaching stop, Kansas State, Hill had helped the Wildcats land Assault player Michael Beasley, Rivals.com’s No. 1 player in the 2007 class. As noted in an August 2014, feature written by Sports Illustrated’s Pete Thamel, Williams did not maintain a relationship with D.C. Assault co-founder and convicted drug dealer Curtis Malone. In October 2013, the month before Trimble was set to sign his National Letter of Intent with the Terrapins, Hill took a leave of absence in the wake of his third reported arrest in five years for driving under the influence. By the time his resignation was announced, Trimble had been committed to Maryland for nearly a year and was set on joining the Terrapins. Hill said that while recruiting Trimble he had communicated with Eric Moses, who first coached Trimble at DC Assault when he joined as a 12-year-old and who now serves in a basketball operations role for DC Premier, the re-branded version of DC Assault. Moses said he initially advised Trimble to pick Maryland and characterized having Hill on staff as a “major plus.” Even though Moses said he was “skeptical” about Trimble going to Maryland when Hill left the program, Moses said he established a good relationship with Turgeon and former director of basketball operations Dustin Clark. According to Trimble’s mother, Kim, Turgeon had “come on strong” in trying to land Melo for the Terps. After Hill resigned, Kim remembers asking her son if he still intended to sign his NLI or if he wanted to wait to explore other options. Explaining his decision as “pretty straightforward,” Trimble decided to sign. “The one question that I remember them having was to make sure that on a day-to-day basis they were going to have an open line of communication with one of us assistants,’” said Clark, who was promoted to an assistant’s position on Turgeon’s staff and became more active in Trimble’s recruitment after Hill’s departure. While all that was going on, Trimble was developing into one of the nation's top prep point guards. When he first committed to the Terrapins in Dec. 2012, his junior year at Bishop O’Connell (Va.) High, he had shown flashes of his potential but was not considered one of the top backcourt players in the country. Jerry Meyer, the Director of Basketball Scouting for 247Sports, said he barely remembers hearing of Trimble before his pledge to Maryland. The turning point in Trimble’s recruitment came when he began to transition to point guard from shooting guard after his sophomore season in an effort to both help O'Connell that year and to help himself succeed at the next level. The transition brought both added playmaking responsibility and required that he become a better vocal leader, but he gradually took to the position. By the end of his senior year, Trimble had become Maryland’s first McDonald’s All-American since 2003 and was named The Washington Post’s 2014 All-Metro Player of the Year. The Recruiting Services Consensus Index, which incorporates rankings from several recruiting services, placed Trimble at No. 34 in its final update on the class of 2014. His signing to Maryland came one class after a major recruiting letdown. The Texas-based twins Andrew and Aaron Harrison, both of whom were ranked in the top 10 of the RSCI, chose Kentucky over the Terrapins. Trimble became the centerpiece of a four-man class that ranked No. 12 nationally by Rivals.com. When he arrived at Maryland in June, the team's first priority was getting him into college game shape. During Trimble’s high school career, he was, as his high school coach, Joe Wootten, put it, a “fast food guy.” Dixon would tease Trimble by calling him “dough boy.” Kyle Tarp, who oversees the team’s training and nutrition, instructed Trimble to drink water and made recommendations about healthier foods and the times of day he consumes those foods. Tarp, who commended Trimble for his motivation and attitude, said Trimble benefited from exercises designed to increase his range of motion. The changes ultimately paid off for Trimble, who lost 18 pounds and whose body fat percentage dropped his body fat by more than eight percent, according to a Maryland basketball official. While Trimble benefited from tweaking his diet and taking on a demanding workout regimen, his transition from high school basketball to the college game was not as smooth as some may have anticipated. Trimble said the pace of play was “super fast” and that, as he tried to make adjustments to his game, he needed to come to grips with the fact that he was no longer one of the tallest players on the court. Trimble overcame those issues, but the first three games of his college career did not portend his emergence as a star. Trimble connected on only eight of his 23 shot attempts in wins over Wager, Central Connecticut State and Fordham. During the win over the Rams, Turgeon had a simple message that resonated with Trimble and helped turn his season around. Four days later, Trimble dropped a season-high 31 points in a five-point win over Arizona State. His play became even more important for Maryland when senior guard Dez Wells, the team’s leading scorer at the time, fractured his right wrist in a win over Iowa State on Nov. 25. Over the seven games Wells missed while recovering from the injury, Trimble helped the Terrapins post a 6-1 record, a stretch that included a win at likely NCAA tournament team Oklahoma State. Bubble Watch: Can Jack Gibbs' return push Davidson into the tournament? 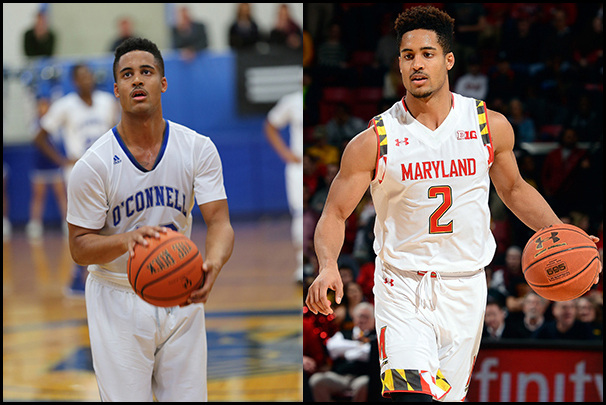 Trimble had to make another adjustment once the Terrapins reached conference play. During Maryland’s Big Ten slate, Trimble has averaged 16.3 points per game while slightly increasing his possession workload and assist rate even though he said after a Feb. 11 win over Indiana that he had been dealing with back and leg pain. A recent two-game shooting slump in which Trimble scored seven total points on 0-of-13 shooting didn’t significantly damage his reputation as one of the best point guards in the country. To wit: Trimble ranks second among Big Ten freshmen in conference scoring and assists (behind Ohio State’s D’Angelo Russell) and was one of only two freshmen in the country (along with Duke’s Tyus Jones) to be named a finalist for the Bob Cousy Award, which is given to the nation’s top point guard. Trimble is a proficient scorer and skilled passer, but what sets him apart from most other point guards is his ability to draw fouls and convert his opportunities from the line. Entering Wednesday, Trimble ranked first in the Big Ten with 190 free throw attempts while connecting on a conference-best 87.9% of his freebies. Trimble is adept at barreling into the lane and absorbing contact, and says he’s watched NBA All-Stars James Harden, Damian Lillard and Kyrie Irving to hone these skills. 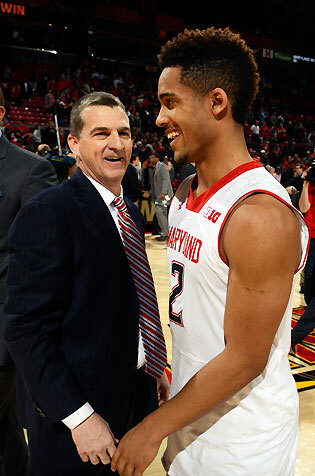 Turgeon defended Trimble on the next Big Ten teleconference. The coach said that he thinks Trimble “deserves to go to the line a lot more” and described Trimble’s ability to draw fouls as an art. “He’s good at it and he gets fouled a lot,” Turgeon said. The chart below shows how Trimble stacks up with the guards rated in the top 50 of the final class of 2014 RSCI. Note that players who have not played a single minute in college basketball this season were excluded. Trimble has drawn more fouls per 40 minutes than any of his peers and logged the second highest percentage of possible minutes, according to kenpom.com. Though drawing fouls is perhaps Trimble’s most potent skill, those who have watched him play also point to his poise and composure. Turgeon said that Trimble “doesn’t get too sped up” and “knows what his limitations are.” There are moments when Trimble shows emotion, like the time he crossed Michigan State's Lourawls Nairn Jr. into a pretzel before burying a straightaway three near the end of the first half of a 75-59 home win over the Spartans on Jan. 17. Plays like that have put Maryland on track to go dancing again. 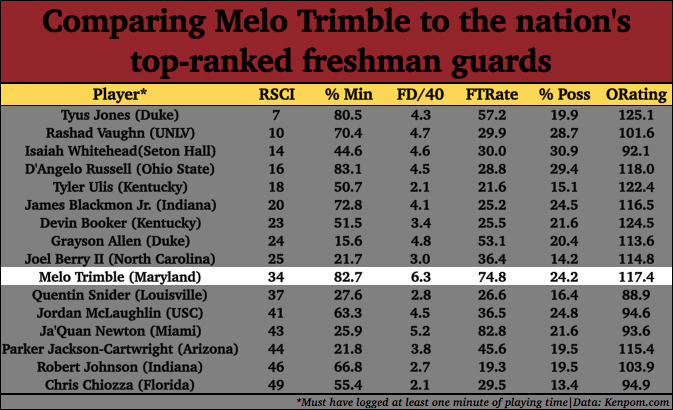 More than Trimble’s highlights, though, the Terrapins are benefiting from Melo being Melo.